Great, swinging big bands are few and far between these days. A lot of water has passed beneath the bridge since we’ve heard groups that meet the standards set by Basie, Ellington, Gillespie, Mingus, Adderley, Ferguson, Corea, GRP and Grusin. Well, weep no more; Resuscitation, a big band led by Chris (Doc) Stewart, has arrived. Stewart is a real doctor, and has practiced that art for more than 25 years. Before that, he lived in the musical world. He was the sixth of nine children, in a family where everyone played an instrument. Born in Anaheim, California, he moved to a farm in Illinois, then back to Anaheim when he was 12 (where, incidentally, he lived in a house just doors away from his future wife, Patty). He chose the alto sax as his horn, complementing with flute during his high school days. He won a talent contest at Disneyland, and played gigs during and after his high school years. He was good enough to work with Louie Bellson, Bill Watrous, Toshiko/Lew Tabakin and others. He and Patty were married in 1981, and for the next decade he lived two lives: playing jazz and earning a medical degree. Patty was instrumental in the success of the latter endeavor, and they recently celebrated their 33rd wedding anniversary. Doc currently practices in the ER section of the Mayo Clinic in Scottsdale, Arizona. In his “spare” time, he spends hours transcribing the music of his favorite artists: all of Eddie Daniels’ solos from his To Bird, with Love LP, and all of Cannonball Adderley’s solos (the basis of Stewart’s 2005 release, Phoenix: A Tribute to Cannonball Adderley). This new album is stunning. The big band consists of six woodwinds, six trumpets and flugelhorns, four trombones, piano/keyboard, bass and drums. Every member is a star in his own right; as just one example, Stewart and pianist Matt Catingub have played together for more than 30 years. 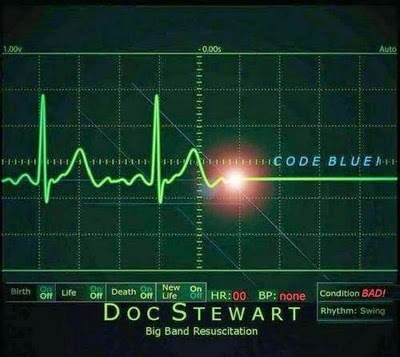 We begin here with the four movements of “Code Blue Suite,” written by Stewart and Tom Kubis; that vibrant wake-up call runs more than 20 minutes. The next 10 swingers consist of traditional charts used by the Cannonball Adderley Quintet and icons such as Kubis, Julian Adderley, Hal Galpar, Oscar Pettiford, Bobby Timmons and Charles Lloyd. The two American Songbook standards are Kern’s “The Way You Look Tonight” and Hubbell’s “Poor Butterfly.” Most of the arrangements are by Stewart, Kubis and Catingub. It all swings like crazy, and the solo work — whether by Stewart or other band members — is outstanding. I particularly enjoy the lines done by the entire woodwind sections, on “The Way You Look Tonight” and “Bohemia After Dark,” in the fashion of the old SuperSax band. All I can say is more ... more ... more!